Lead image: A Northrop Grumman MQ-4C Triton soars at high altitude. Photo courtesy of DoD/NAVAIR. TRITON lives within Greek mythology as a fish-tailed sea god, the son and herald of Poseidon, king of the seas. Triton both calmed the seas and frightened enemies with the blow of a conch-shell trumpet, and when the Argonauts were stranded in the desert Triton helped them find passage back to the sea. 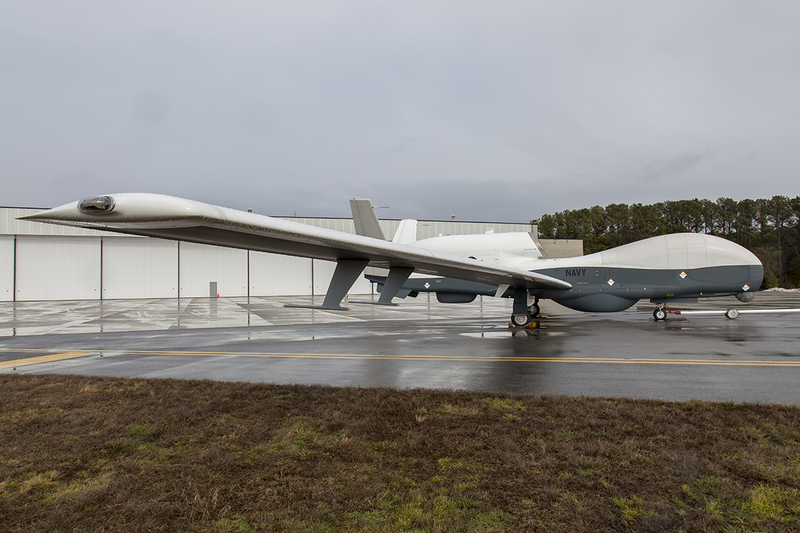 The Northrop Grumman built MQ-4C Tritons “trumpet” is a feed of unparalleled information simultaneously directed to the Main Operating Base (MOB), the National Intelligence Center, Carrier Strike Groups, the P-8A Poseidon, and others. By generating situational awareness and facilitating the mobilization of Naval assets the Triton will bring calm to the seas, and the retreat or defeat to any number of bad actors. Effective military forces of the future will be information enabled. USAF drones, the F-35 or any other number of assets make it clear that future war fighting will be driven by information, and the ability to share information. The MQ-4C plays a critical role feeding real time information to both strategic and tactical Naval forces. The Triton is a force multiplier, making networked assets more effective, efficient and lethal. 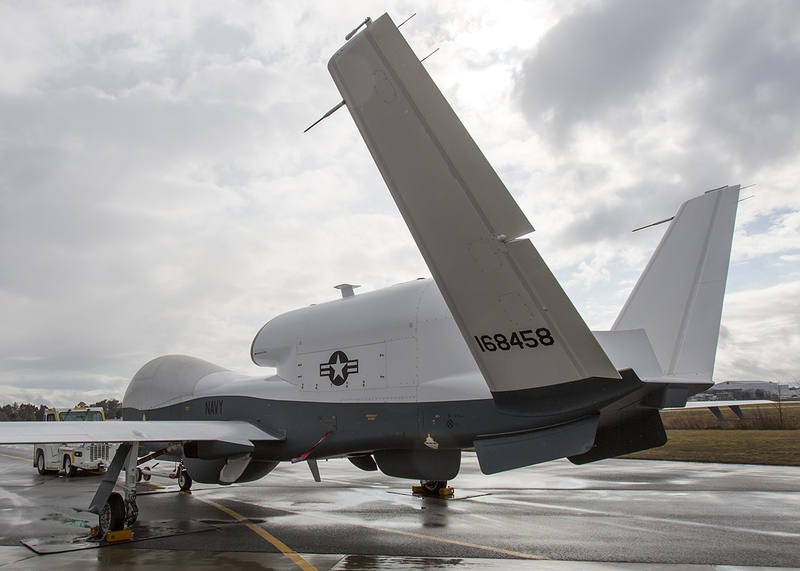 Born out of the Broad Area Maritime Surveillance (BAMS) program, the MQ-4C Triton is a derivative of the RQ-4 Global Hawk featuring significant modifications to the airframe, systems and sensors. It is an extremely capable platform, so capable that many debates have arisen about the possibilities of the Global Hawk replacing the venerable U-2 altogether. 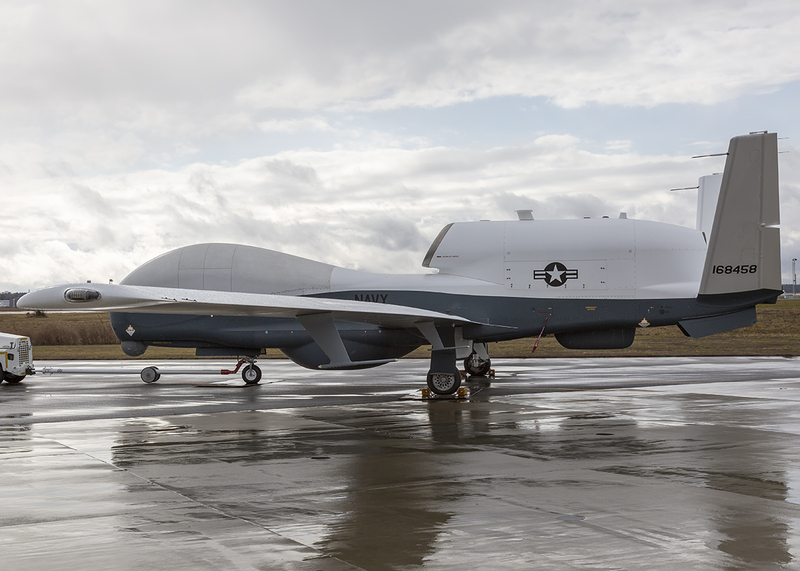 Given the MQ-4C is more capable than the Global Hawk in a number of areas – flight parameters, sensors, and communication, it surely provides exceptional capability. The US Navy’s duo of P-8A Poseidon & MQ-4C Triton are replacing the P-3C Orion’s and are integral to the Navy’s Maritime Patrol and Reconnaissance Force (MPRF) and broader Intelligence, Surveillance and Reconnaissance (ISR) strategy. The Triton will provide a superior picture of what is happening above the surface, enabling the Poseidon to focus on what is below the surface. 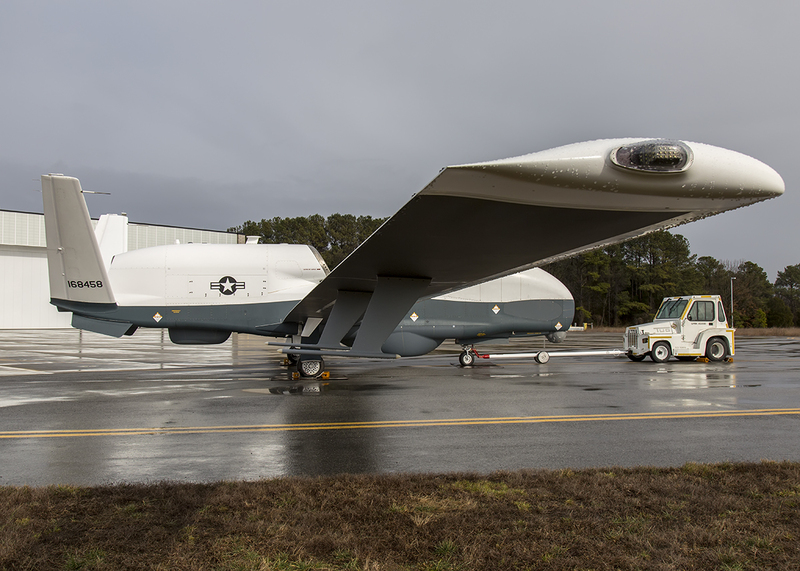 While the Triton itself may be referenced as an unmanned aerial vehicle (UAV), the program is more accurately referenced as an unmanned aerial system (UAS), a combination of UAV, Flight control and payload operators stationed at a MOB. The Triton will support a broad mission set including maritime ISR patrol, signals intelligence, search and rescue and communications relay. Look no further than the MH370 incident and the decade of “unceasing” pirate activity off the coast of Somalia to reflect on the challenge of addressing maritime situations. It would seem to the casual observer that someone should have the capability to quickly address such issues. Such is the vastness of the ocean that despite all the technology, one can still easily be lost by accident or intention. The Triton’s 360 degree sensor capability, perched at high altitude with 24/7 persistent presence (with rotation) will provide the kind of over watch or search and rescue that would be invaluable in these scenarios. Three Tritons have been delivered to NAS Patuxent River in Maryland where they are undergoing operationally oriented sorties to verify the mission systems meet the Navy’s specifications. The Triton flies about twice per week out of Pax River, with flights lasting up to a maximum of 10-12 hours (they are not yet operating at maximum fuel load). In total, the MQ-4C is coming up on about 60 total flights with nothing more than straightforward integration issues to date. 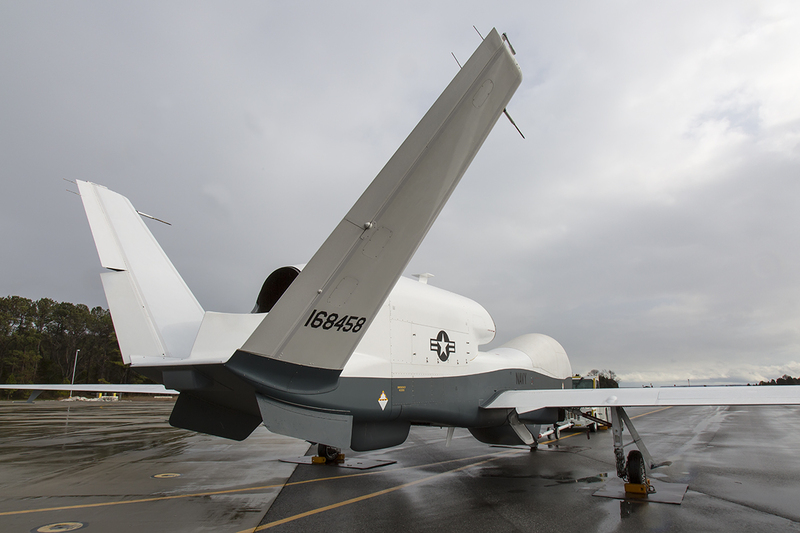 With the first flight of the Triton taking place in May 2013, the development plan included 3 primary stages, each built around three designated software builds referred to as Integrated Functional Capabilities (IFCs). IFC 1.0 – Implementation of line of site communications and build out of the flight envelope. IFC 3.0 – Introduction & validation of the Anti-Ice & De-Icing systems, active Center of Gravity control and additional airframe systems to maximize fuel load and fuel efficiency, as well as additional radar modes for coastal environments. Like complex and critical software roll outs, functionality is thoroughly tested in lab environments, and then rolled out for field testing and resolution of any integration issues prior to going operational. It is the field testing, integration and performance validation that currently rests with the team at NAS Pax River. IFC 1.0 and initial flight envelope expansion was validated out of the Northrop Grumman facility in Palmdale. Arriving from Palmdale Sept 2014 utilizing IFC 2.0 the UAS spent the summer and early fall of 2015 building stability in the systems such as the flight control computer, mission control computer, engine operation, payload sensors, communication, and power and cooling systems. The team realized system stability in the fall, at which point they handed the UAS over to the OA team to perform a number of flights (approx. 6 flights totaling 60 hours of flight time) through December 2015 / January 2016 to verify the UAS was performing to US Navy specifications. Given the teams experience with the systems and sensors indicated they exceeded threshold requirements, Program Manager Burke is confident the OA teams final report will be positive. Though at the time of our discussion in early February there was a significant amount of data analysis pending. A positive outcome of this OA will support the U.S. Navy’s Milestone C review, and lead to entry into low-rate initial production (LRIP) contract for four aircraft. Given a successful outcome of the IFC 2.0 OA, the Pax River team will begin to implement and validate IFC 3.0, the final build that will be utilized for Initial Operational Capability (IOC) anticipated 2018. The US Navy still intends to buy 68 aircraft to ensure adequate global coverage capability. The US Navy has just recently started the formal scoring (summer 2015) to determine the reliability/readiness of the UAS. The system considers metrics for both “operational availability” and “effective time on station” in simple terms, “is it able to go fly, and is it usable for the duration required on station?” There is a reliability growth curve built into the plan as they move through IFC 2.0 and 3.0 to IOC. The sheer size of the Triton is hard to appreciate. The bulbous nose strikes me as “beluga like,” yet the long slender wings and flight characteristics imply the grace of a high altitude glider. The Tritons wingspan is some 13 ft greater than the new Boeing 737 MAX 8, yet operates at a gross weight of almost one sixth the 737 – it is a high altitude fuel sipping sensor platform. 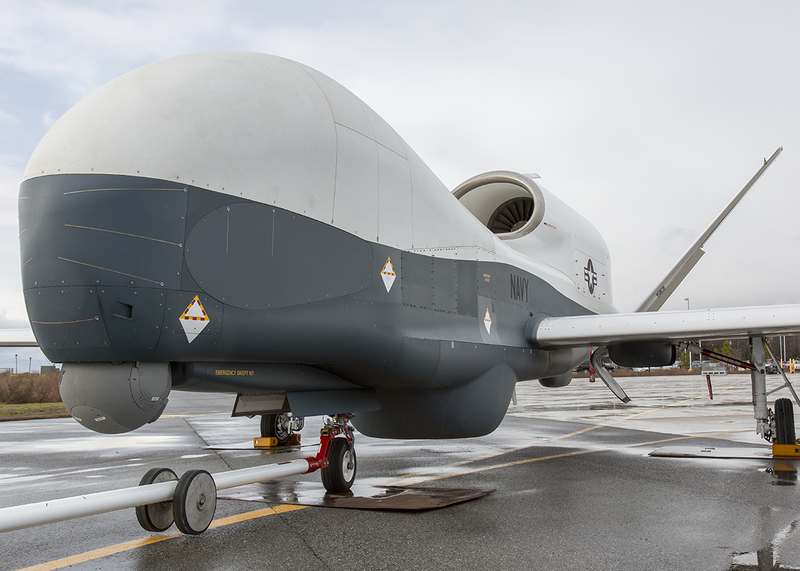 Built on the same production line as the RQ-4 Global Hawk, and outwardly looking like “identical” the MQ-4C Triton has a number of critical design features that optimize it for performance in the demanding maritime environment. The Triton features thicker wing skins, a heated engine inlet, anti-icing and deicing systems on wings and tail. 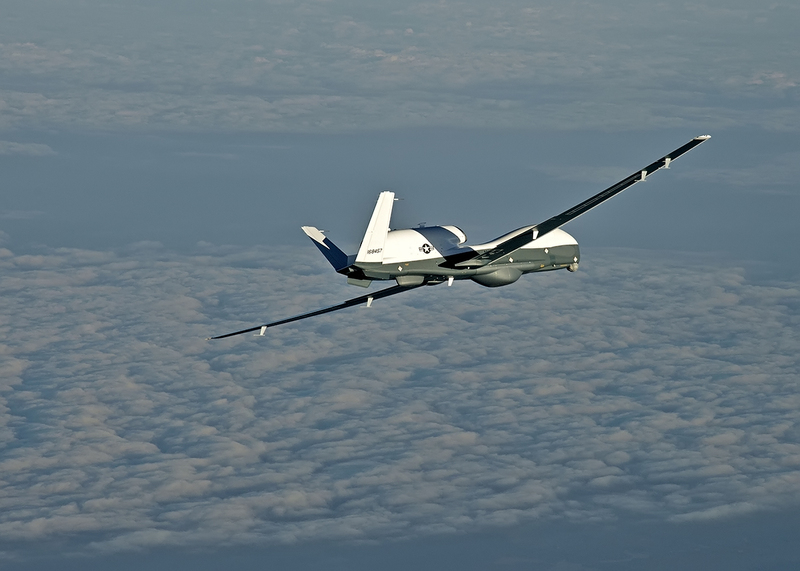 This ensures the Triton will be more than capable to fly in the kind of stormy weather (including high wind gusts, lightning, hail) more typically seen over the oceans, as well as descend through ugly turbulent conditions when required to put its optical camera (EO/IR) on a situation, and then climb back to altitude afterwards. 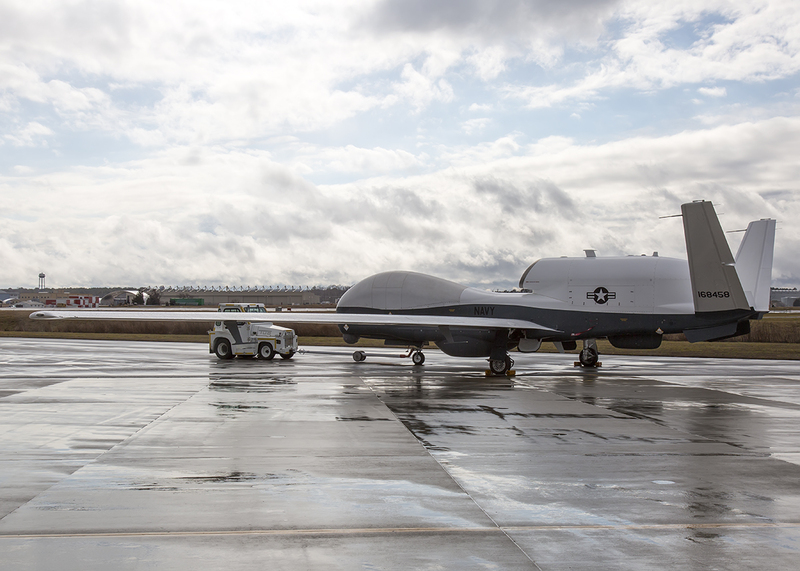 The MQ-4C features a unique sensor package and communications suite, and the ground stations utilize a specific philosophy that facilitates improved communication and team work amongst the operators. This maritime optimized feature set requires different internal routing of systems, power, de-icing, communications etc. and results in a UAV that is slightly heavier than the Global Hawk. However, one additional benefit to operators, the Triton makes autonomous adjustments to ensure optimum fuel burn given weights and winds. According to Northrop Grumman Northrop Grumman the aircraft can fly over 24 hours at a time, at altitudes higher than 10 miles, with an operational range of 8,200 nautical miles, a complete Northrop Grumman Fact Sheet is available here. The payload also includes communications relay equipment and Link-16 communications capability. The Triton’s radar includes both Inverse Synthetic Aperture (ISAR) and Synthetic Aperture (SAR) modes. The AIS receiver will read transmitting vessels transponders. Given those on the seas up to nefarious activity often turn their transponders off, the capability to descend below clouds and capture imagery or stream live video via the EO/IR will ensure no vessel goes unwatched. The US Navy has thoughtfully considered the deployment of the UAS. Throughout the services the use of UAVs has often resulted in air vehicle operators (AVO) or pilots in one location, with payload operators and Intel personnel in another location. Very focused on the tactical utility of the system with direct feed to Carriers, Expeditionary Strike Groups, P8A, the Watch Centers etc. the US Navy determined to pull all personnel into a single control station, where they would function as if they were on an aircraft themselves. Within that context Program Manager Burke identified the 3 components of the UAS. Each MOB contains 2 Main Control Stations (MCS) that function independently and simultaneously. The MCS is configured as if the crew were on an aircraft, with Tactical/Mission coordinators, AVOs (3 stations so inbound, outbound and on station UAVs can be operated) and payload operators clustered together. At any given time, only one of the potentially 3 airborne UAVs is feeding the payload operators and streaming to associated assets. The two main control stations are situated side by side separated by a glass wall, with instructors in the midst. While one MCS is operational with 3 UAVs, the other one can be training or offering support to the primary. Payload (sensor) data is feed directly back to the MCS where the tactical & sensor operators monitor the feed real time. The feed also goes to a teleport which feeds to National Intelligence centers with everything manned 24/7. The quality of the sensor data is such that decisions can be made based on hard data, rather than judgment. With sensors streaming data on a common data link the data can be fed simultaneously to the carriers, P8s, and even forward forces even while the intel services as performing deeper analysis. UAV C2 is enabled from both the FOB and MOB via satellite communication, or when enabled, via line of site. UAVs stationed at the forward operating bases (FOB) in Guam, Sigonella or the Gulf will be serviced by local maintainers, and launched with a local AVO. 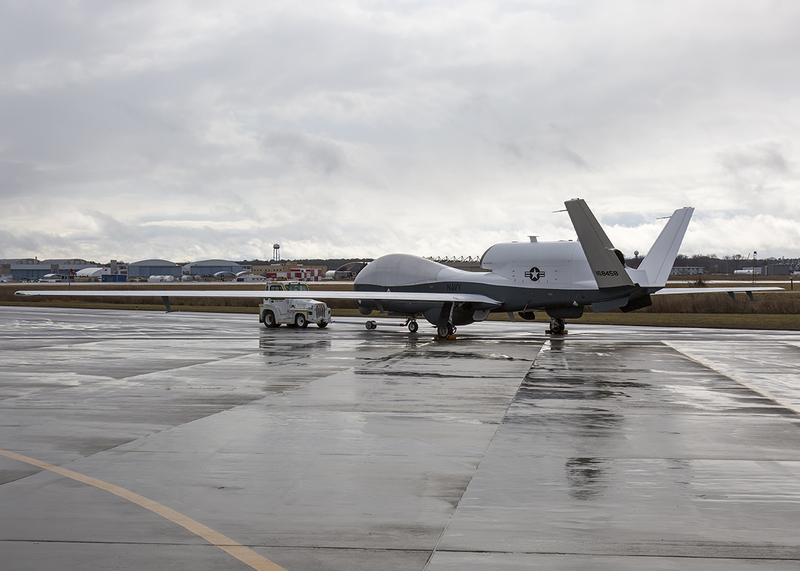 Once airborne C2 of the UAV will be passed over to the appropriate MCS at the designated MOB in either NAS Jacksonville or NAS Whidbey Island. From an AVOs perspective, the Triton operates under what is essentially instrument flight rules (there is no forward facing camera on the Triton to provide a viewing capability for the AVO). Emulators have been developed so that the AVO can be fully qualified with virtually no flight hours required on the actual UAV. As both the Triton and Poseidon are being introduced as replacements for the P3C the Navy has planned for a high degree of operational integration between the two platforms. It is anticipated that Triton Squadrons will rotate personnel in who have qualified on the Poseidon as payload operators, aerial vehicle operators (AVOs/pilots) and maintainers. In any case a high degree of interoperability between the two is planned. 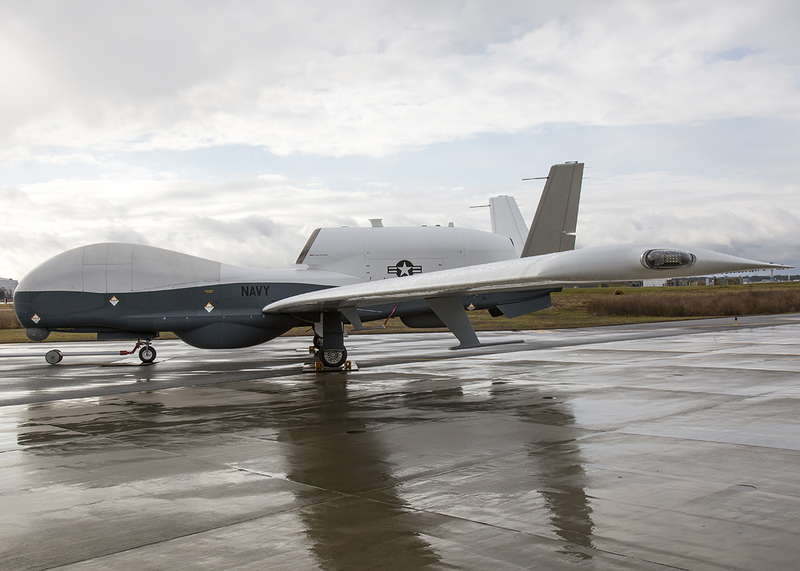 The exceptional capability of the Triton has not gone unnoticed by allies, and in particular Australia has shown interest in procuring a number of Tritons. With a coastline some 22,000 miles (36,000km) and tensions are increasing in the area (South China Sea) the Triton seems a valuable asset to Australia’s services. The Triton would be not only cost effective, but invaluable in ISR, search and rescue and communications roles. It would also be an exceptional fit in the “information transformation” of Australia’s military that already includes the E-7A Wedgetail, and the F-35A Lightning II. Work on a planning case is underway to support the necessary flight clearances, air worthiness qualifications and technology transfers in the context of an Australian procurement. Special Thanks to NAVAIR PAO Unmanned Aviation and Strike Weapons Jamie Cosgrove & US Navy Triton Program Manager Sean Burke. Todd Miller resides in rural Maryland west of Baltimore. Given less than required eyesight Todd's dreams of fighter pilot were grounded, but the love of military aviation has never subsided. Todd enjoys capturing military aircraft through photography, with a particular desire to capture them in mission action. When not busy chasing jets, Todd works in the area of Business Development for a prominent flooring materials company. 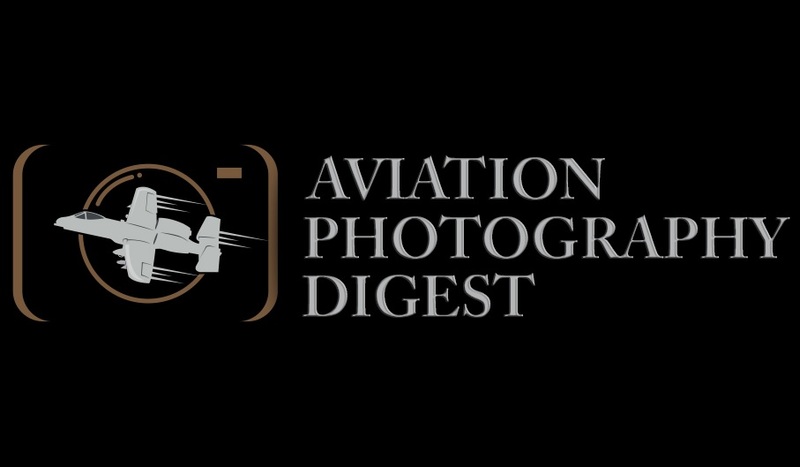 Copyright © 2012-2019 Aviation Photography Digest. Contents of this website may not be used without prior written permission. All rights reserved. Subscribe to our FREE newsletter and get notified when new articles are published.